At least six have been killed including two children after a massive 8.1 earthquake struck off the south coast of Mexico triggering a tsunami experts fear could reach three metres high. 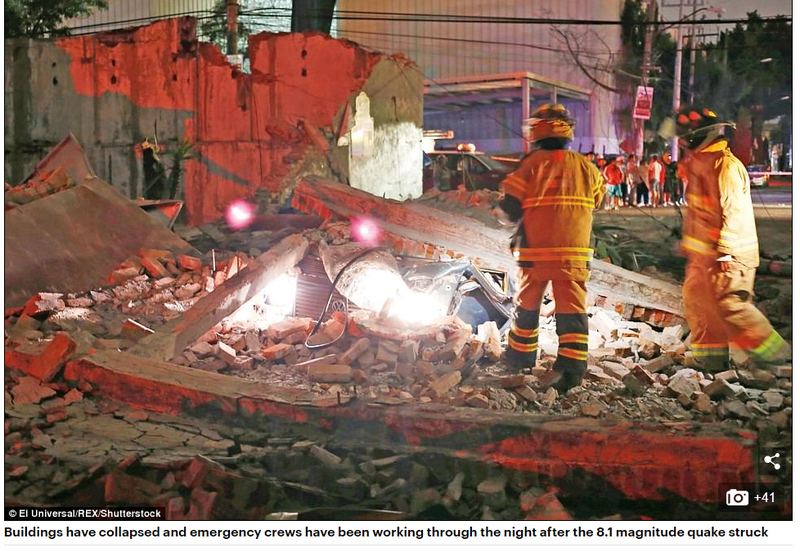 The earthquake was felt across Mexico, toppling houses, shaking buildings in the country’s capital and leaving a million without power amid reports tremors were detected as a far away as Austin, Texas – more than 1,300 miles from the epicentre. A small 3.3ft tsunami has already been detected in Mexico after the quake struck at 11.49pm last night, 76 miles southwest of the town of Pijijiapan, at a depth of 43 miles. But Seismologists at the Pacific Tsunami Warning Center said it could grow to 12ft. Terrified residents in Mexico City ran out into the streets after the quake struck, witnesses said. Tremors were the strongest in a hundred years, according to President Enrique Pena Nieto – greater even than a devastating earthquake in 1985 that hit the capital flattening swathes of the city and killing thousands. The US Tsunami Warning System said widespread hazardous tsunami waves were possible within the next three hours on the Pacific coasts of several central American countries – Mexico, Guatemala, El Salvador, Costa Rica, Nicaragua, Panama, Ecuador and Honduras. As far as 8,700 miles away in the Philippines, the national disaster agency put the country’s entire eastern seaboard on alert. The only tsunami detected so far, however had a largest wave measured at 3.3ft, experts said. The death toll has already risen to at least six people, including two children in Tabasco state. The other three deaths were in Chiapas state, in San Cristobal de las Casas, with two crushed when buildings collapsed on them. Its far away!!! Many countries in between!!! They must think of JOSE, not to stress them with what else is happening! This is terrible news but it is the Pacific side. No threat to SXM.